Julio Duarte received his Pharm.D. and Ph.D. degrees from the University of Florida. After completing training, he became an assistant professor of pharmacy practice at the University of Illinois at Chicago where he served for over four years. 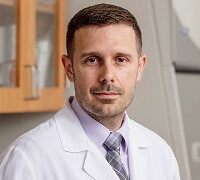 While there, Dr. Duarte became the director of the pharmacogenomics laboratory, and also co-director of the University of Illinois Hospital Personalized Medicine Program. In late 2015, he returned to the University of Florida as an assistant professor within the department of pharmacotherapy and translational research. Dr. Duarte’s research interests include the biological mechanisms behind both disease development and drug response in heart failure and pulmonary hypertension. His NIH-funded laboratory conducts translational research, attempting to discover genomic predictors of drug response, as well as using genomics to identify novel targets for future drug development. He has served on U.S Department of Defense grant review committees and is also an active member of the Council for Functional Genomics and Translational Biology within the American Heart Association.